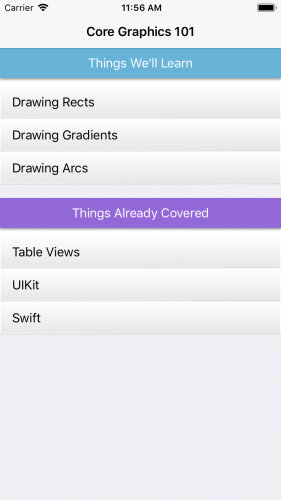 Update note: Ehab Amer updated this tutorial for iOS 12, Xcode 10 and Swift 4.2. Ray Wenderlich wrote the original. Until iOS 6, gloss effects were common across iOS, from buttons and bars to almost any element in the UIKit. With iOS 7, Apple changed its design approach to a flatter interface. That doesn’t mean that it’s wrong or outdated to use gloss effects! It’s still important to know how to create them. Core Graphics makes it easy. For this tutorial, you’ll work on a project called Cool Table. The project itself covers many topics about Core Graphics, but for this tutorial, you’ll focus on how to create a shadow and a simple gloss effect on views. To start, click Download Materials at the top or bottom of this tutorial. Open the starter project in Xcode and run it. You’ll see a grouped table consisting of two sections, each with a title and three rows. All the work you’re going to do here will be in the title view of the sections, so there’s no need to worry about the rows. Right now, the table presents the section title through the tableView(_:titleForHeaderInSection:), which doesn’t allow for much customization in the header. 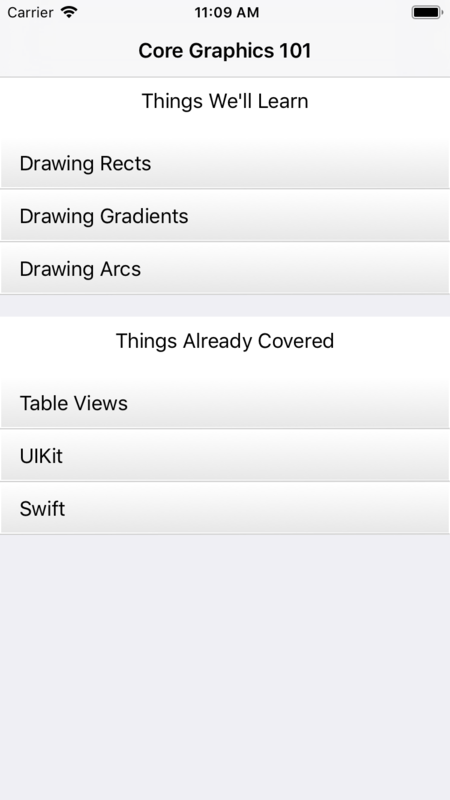 To be able to customize it, you want to set up the header with tableView(_:viewForHeaderInSection:). You could create the custom view using code only. You could create the custom view using Interface Builder. Both are good options, but here, you’ll take the second approach. You’ll create and customize the view in Interface Builder and supply it as the header view. In the Project navigator, create a new file using the Cocoa Touch Class template. Name the class CustomHeader. 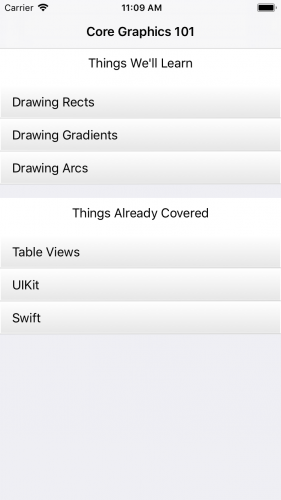 Make sure it’s a subclass of UIView and the language is Swift. 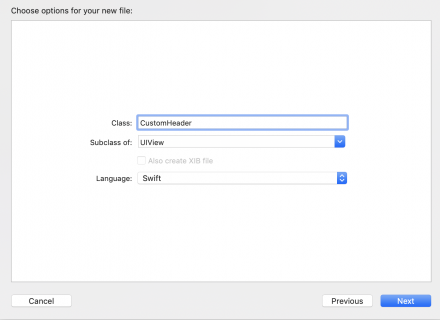 Once you have created the empty UIView subclass, create a .xib file named CustomHeader. This time, instead of choosing Cocoa Touch Class in the template selection, choose View in the User Interface group. In the new XIB file, you’ll find one view. In the Identity inspector, change its class from UIView to CustomHeader, which is the class you just created. Open the Library from the View menu and drag a label onto the view inside the XIB file. Create all four constraints for the label with 4 point spacing from the left and right, a distance of 0 from the top and 10 from the bottom. In the Attributes inspector, set its text alignment to center. Select the CustomHeader view again. In the Attributes inspector, change its Size in the Simulated Metrics group from Inferred to Freeform. In the Size inspector, set the height of the view to 50. Next, in CustomHeader.swift, add this line for the UILabel outlet. Make sure to connect it in the XIB file. @IBOutlet public var titleLabel: UILabel! loadViewFromNib() is a class method that creates and returns CustomHeader for you. Using a standard initializer won’t do the trick here. The code loads the view as explained in the previous step, sets the text of the label, and returns the new view. Build and run. You’ll see the new header you just created with a white background. Now that you have a canvas for your header, you’re ready for the fun part. First, consider what you need in the masterpiece you’ll draw. The header is split into two areas. In the image above, there are three points to pay attention to. A gradient with a gloss on it. A small shadow right under the colored area. A stroke line around the header. The area of the shadow is 10 points. This is why the bottom constraint under the label is 10. You know the height of the full header is 50. Therefore, the colored area is 40. Why not define those regions visually by giving each a different color? You’ll give the gradient area a red background and make the shadow area green. 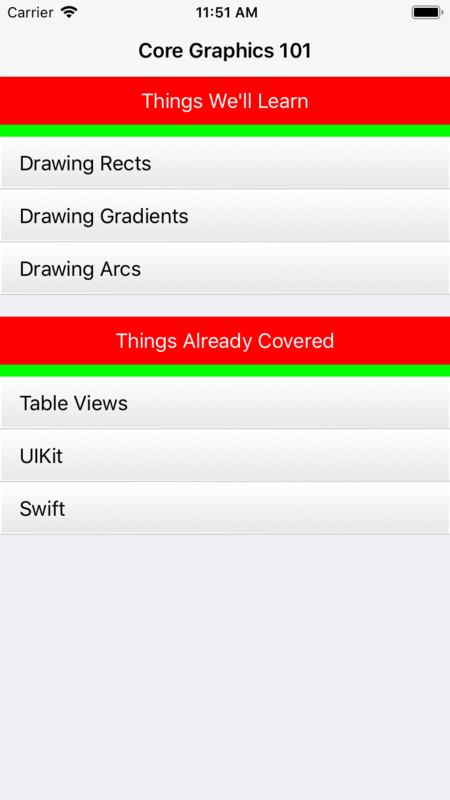 An @IBInspectable value lets you do as much UI customization as possible directly from Interface Builder. It’s a good practice to have any numbers declared as constants or properties instead of having many numbers scattered around in your code. Most of the time, you’ll forget the specific number you used when you look at your own code after a couple of days. Calculate the two rectangles that you’ll color. The first is the area that will have the gradient. The second is the shadowed area. Both are calculated based on coloredBoxHeight that you defined earlier. Get the current Core Graphics context and draw the two colored rectangles. Now, change the text color of the title label in CustomHeader.xib to white directly from the Attributes inspector. Build and run. You should see your colored headers. Next, in draw(_:) method remove the following four lines from the bottom of the method. Define the shadow as a gray color with 50% transparency. Save the current graphics state so you can apply any configuration changes you need and return back to this state when you finish. Set the shadow configuration for anything you will draw. Draw the colored box. Without this there will be no shadow applied on the screen. Return to the graphics configuration you saved above. This is to show a different color for the second table section. darkColor is not used yet, so don’t worry about it. Build and run. You should see a huge improvement from last time you ran the app. The headers look better now, right? Next, you’ll add a gloss effect. There’s more than one way to apply a gloss effect. Matt Gallagher and Michael Heyeck explained harder ways to do it, but here, you’ll learn a simple way. For simplicity’s sake, implementing an approximation of a gloss effect by applying a gradient alpha mask is good enough approach for now. Pro tip: this is a commonly used approach, so why not put it in a separate file for easy access in later projects? Extensions.swift is the file for that job. It has a few handy extensions that make things much easier. Call another method that’s in the extensions file from the sample project which draws a two-color gradient in a rectangle. Define the two white gloss colors. Calculate the rectangle that will have the white gradient, or the gloss. This rectangle is half the colored gradient area. Draw the white gradient in the smaller rectangle. Build and run. You’ll see a nice header with a gradient color and a gloss effect. Build and run. Notice the darker stroke that you wanted. CGContext has a lot of interesting drawing tools you can use to draw paths, lines, shapes, text, and images. It’s worth looking at the developer documentation and experimenting with it. I hope you enjoyed this tutorial. If you have any questions or comments, please join the forum discussion below.